PortaSwitch® provides excellent capabilities for real-time routing (LCR, profit-guarantee routing, individual routing plans, etc.). This allows any customer’s routing to dynamically respond to even the slightest change in a vendor’s rate, so there is no need to “rebuild” the routing table or perform any other manual operations after a new tariff for a vendor is uploaded. For example, when sending calls to UK-Proper, 20 percent of all traffic should go to the X-Telecom carrier and 80 percent to the GlobalNet carrier. 1. On the navigation menu to the left, select Infrastructure, then Voice calls processing, select Routing and open Routing plans. · Name – Type the name of the routing plan. 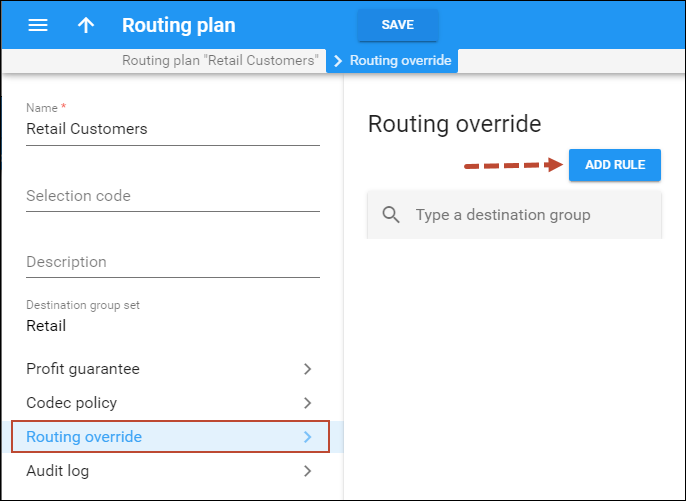 · Define a specific order for the route categories – Disable this option. 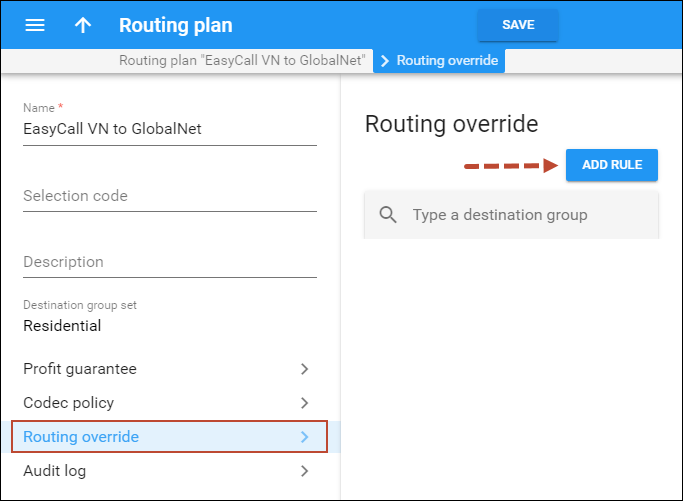 · Least cost routing override – Enable this option. · Destination group set – Specify a set of groups which you want to adjust routing for. Please refer to Creating a Service with Discount Plans handbook for a detailed description of a destination group set configuration. 4. 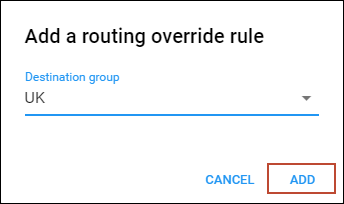 On the Routing override panel, click Add rule. 5. In the dialogue window that opens select the destination group for which you want to configure a specific routing and click Add. 6. Click the Add route button. 7. Select the connections through which the call will be routed before (or instead of) applying a “normal” LCR routing and click Ok.
8. Click the Edit button and then click the Add button to add one more connection through which the call will be routed before (or instead of) applying a “normal” LCR routing. 9. For each connection, specify its probability of being the first in the list of routes. The carrier GlobalNet will receive 70% of all calls and X-Telecom carrier will receive 30% of all calls. Let’s consider the example of an adjustment for a single route only, so that the traffic to Vietnam-Mobile from customer A will always go to carrier GlobalNet. 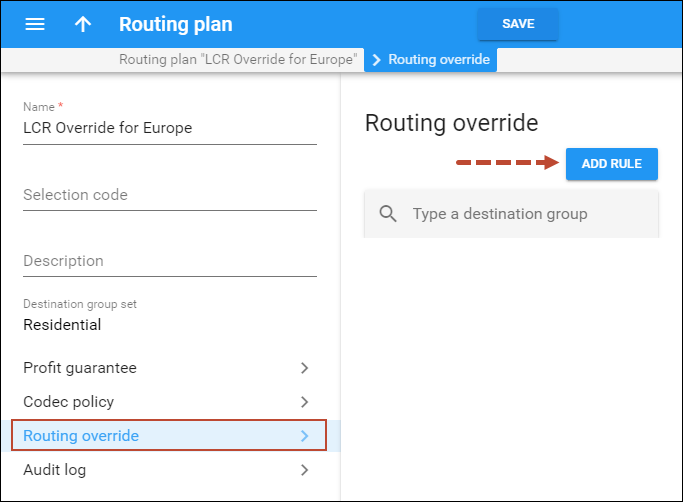 It is possible to create a list of connections for a destination group in a desired routing order, and the call will be routed accordingly, before (or instead of) applying a “normal” LCR routing. 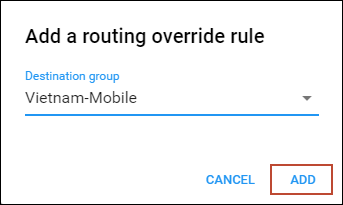 An entry in the override list can be either a single connection or a percentage-share connection pool, where each connection has the probability to be the first route according to the assigned percentage value. Let’s consider the example, where 25 percent of cases send traffic via the connection Europe Premium, 40 percent of cases send via the connection Termination to UK, and the rest (35 percent), should be sent based on LCR (Non-listed connections ordered by least cost routing). This configuration procedure is similar to the previous ones; please refer to the screenshots below for the particulars. With the routing plan created, the question of how to apply it arises. · To assign it to an account. In this case it will be used for calls sent by this account only. 2. 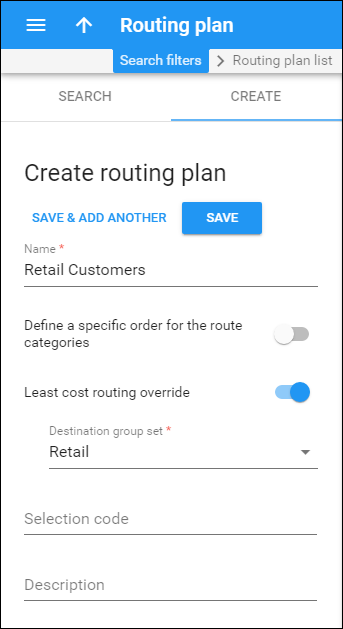 On the Product list panel, click on the name of the product you want to apply the routing plan to. 3. On the Services panel, click Voice calls. 4. 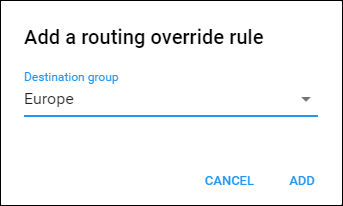 On the Outgoing calls configuration panel, use a slider to enable the Routing plan. 5. 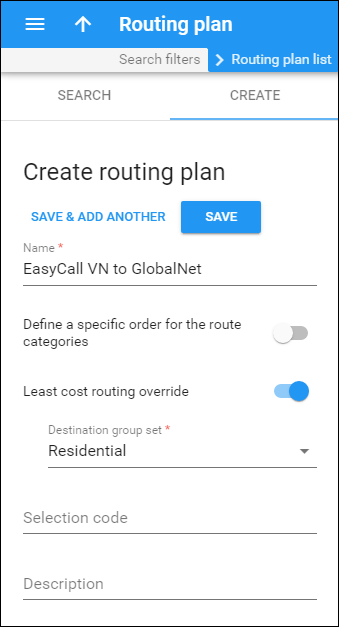 Select the routing plan you have just created in the Individual routing plan field. 1. Open the account you want to assign the routing plan to. 2. On the Service configuration panel, click Voice calls. 3. On the Voice calls configuration panel, select Outgoing calls. 5. Select the routing plan for this account from the list.